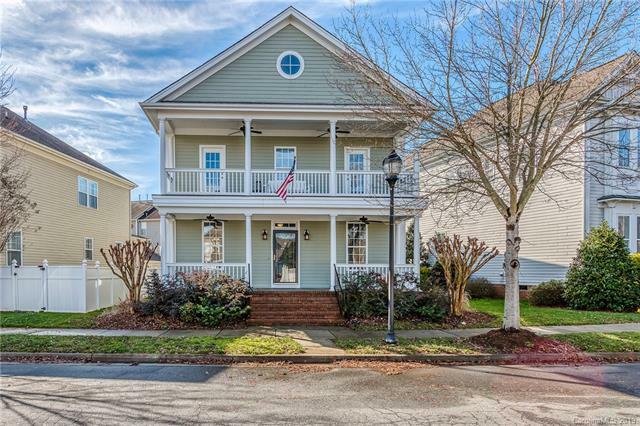 WALK TO BLAKENEY & Green Spaces from this amazing Saussy Burbank Charleston Style Home with Dual Rocking Chair Front Porches, Low Maintenance Yard! Don't miss the opportunity to see this beautiful home in Blakeney Greens. This home is in pristine condition & is ready for the most discerning buyer. It has lovely Charleston Inspired paint, original hardwood floors throughout the main floor, formal living & dining rooms with crown molding & custom blinds, extensive custom lighting fixtures, updated gourmet kitchen with Corian countertops, custom tile backsplash, stainless steel appliances, 42" cabinets with crown molding, recessed lighting, large pantry, & updated powder room! The 2nd floor has a large owner's suite with trey ceiling, crown molding, custom blinds, and plush carpeting. The owner's suite has tile flooring, dual vanity, separate tub & shower, as well as a water closet and large clothes closet. There is also a paver patio & deck in the private fenced yard! Don't delay! !